On the sugesstion of a great fellow E-Bayer, I am adding a new version of my rear pulling hitch.I'm calling it the LAZY MAN'S HITCH. 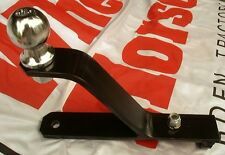 This hitch is made to bolt onto your factory WHEEL HORSE/TORO lawn and garden tractor draw bar (which is NOT included). This hitch is made to bolt onto your factory WHEEL HORSE/TORO lawn and garden tractor draw bar. It is the height of most trailers (14- 16in.). This unit is made of carbon steel,3/8 X 2 with a 3/4 hole for the ball,(WHICH IS NOT INCLUDED). This hitch will fit all wheel horse tractors with the cast iron uni drive transmission hydro or gear drive. Custom heavy duty receiver hitch with mounting hardware. What you see in picture #2 is what you will receive. welds, fit and finish are second to none ! Very satisfied just what ineeded excellent job building it. This is the latest addition to our line of hitches. This unit places the ball at the right height of most trailers. This unit can be made with a standard drawbar(shown) or a "D" ring pull. GENUINE WHEEL HORSE SLOT HITCH 3926. Condition is new. Shipped with USPS Priority Mail. Sold as is with no returns. Thanks for viewing! THIS IS A NEW FRONT TOW HITCH ADDED TO OUR LINE FOR PEOPLE WHO DO NOT WISH TO REMOVE THE MULE DRIVE FROM THEIR TRACTOR WHILE MOVING A TRAILER AND MOWING YOUR LAWN. ONCE YOU INSTALL THIS UNIT, WHICH TAKES ABOUT 15 MIN., IT IS PERMANENT. They will work on hitches made of 3/8" or 1/2" steel. The pin is 9/16" OD. We have added this 2" receiver to our Wheel Horse hitch line. It makes it more universal. You can use your own ball hitch or install a ball ( not included in this sale ) directly on the receiver. This unit could be used to add weights to the front of your tractor. You need to ask if I can accept it. And Is being sold as is. (No warranty). Item will not be painted like the one shown in photos. Buy your Wheel Horse or Brinly Clevis Hitch Now! The Wheel Horse OEM Clevis Hitches were made with 3/8 steel. Note in the picture that these are made from 1/2 steel (a lot stronger to pull more and less prone to bend). If you use yours to mow, you need to remove the mule and tie it up to the side and snap in the hitch. I use mine to tow and blow snow only. Much like driving a fork lift, you can manuever the trailer anywhere. Custom heavy duty receiver hitch to be used with the #104659 snow plow/tiller bracket. What you see in picture #2 is what you will receive. Do not buy if you do not have a #104659 snow plow/tiller bracket. 5 out of 5 stars - Toro Wheel Horse Removable Receiver Hitch (if you have a #104659 Bracket). 1 product rating1 product ratings - Toro Wheel Horse Removable Receiver Hitch (if you have a #104659 Bracket). The Wheel Horse OEM Clevis Hitches were made with 3/8 steel. Note in the picture that these are made from 1/2 steel (a lot stronger to pull more and less prone to bend. arrived very quickly. welds, fit and finish are second to none ! ). 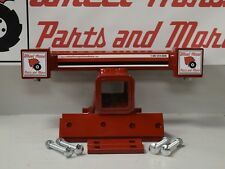 Toro Wheel Horse hitch #104659 (RED) SNOW DOZER BLADE TILLER BRACKET! NEW! 5 out of 5 stars - Toro Wheel Horse hitch #104659 (RED) SNOW DOZER BLADE TILLER BRACKET! NEW! 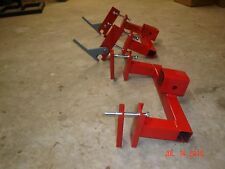 5 product ratings5 product ratings - Toro Wheel Horse hitch #104659 (RED) SNOW DOZER BLADE TILLER BRACKET! NEW! 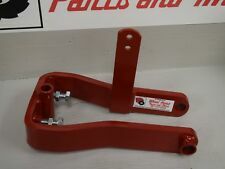 This is a reproduction Rear Lift Arm Assembly Like the Original for your restoration project. you need to ask if I can accept it. And Is being sold as is. (No warranty). The Wheel Horse OEM Clevis Hitches. Alot of have requested it and now the XI series hitch kit's are ready to go complete with fan guard. were made with 3/8 steel. 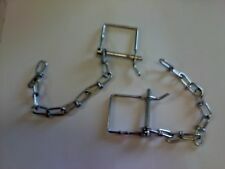 These are made from 1/2 steel (a lot stronger to pull more and less prone to bend). This part is from a 1985-86 Wheel Horse 417-A Garden Tractor.Has a 17 Hp Kohler Twin Cylinder engine,Model # KT17QS,Spec # 24363,Serial # 1608601236. Here is a reproduction Wheelhorse GT 14 upper connector bar that goes from the rock shaft to the rear upper part of the 3 link. Would like the photos to show you exactly what it looks like but rather hard to photo an item such as this. WHEEL HORSE RAIDER 10 1-6041. -HITCH ASSM. -PART # 98-8083-01. -LOCAL PICKUP IS AVAILABLE IF NEEDED DURING OUR HOURS OF OPERATION. -ENGINE: TECUMSEH SBH225, SERIAL 41635. Slot hitch for B, C and other series tractors no cracks or bent arms looks in good condition except for paint. This part is from a 1970 Wheel Horse Raider 10 Garden Tractor,Model # 402504. Has a 10 Hp Tecumseh HH1000 Engine.Has a 42" Mower Deck with 3 Blades. STABALIZER PLATE # 8089 FOR THESE CELVIS HITCHES Wheelhorse Wheel Horse Clevis Hitch Stabalizer Plate. 85311, Clevis Hitch, 1969 thru 1975. 85512, Clevis Hitch, 1976. 85513, Clevis Hitch, 1976. 85513, Clevis Hitch, 1977. 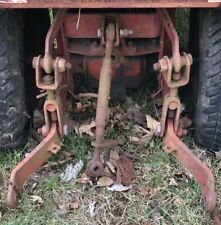 Wheel horse Rj58 and suburban rear hitch ..I only ship within the United States and payment is due through PayPal within 24 hours of auctions end. Sold as is. This is a NEW rear axle bracket for Wheel Horse Tractors. The bracket fits the D160,D180, D200, C195, GT14, 953 and 1054. This is a Reproduction tiller / dozer / snow / rear mount grader blade axle bracket / mount. Complete tractor is not available for sale. Local pickup is available. PART # 85551 OR 8-5551 - FRONT HITCH ACCESSORY. New Genuine - OEM Toro - Lawn Boy - Wheel Horse - Gilson. Model number and serial number required to look up parts. The part shown is the part you will receive. Here is a pair of reproduction lower 3 point arms with cat 0 ball swivels. These are the 5/8 Thick Heavy Duty Arms (new). And Is being sold as is. (No warranty). you need to ask if I can accept it. ITEM IS USED AND IN GOOD ORIGINAL CONDITION. Wheel Horse, Toro Universal Tow Hitch - Garden Tractor Lawnmower - HEAVY DUTY! John Deere F910 F911 F912 F925 F935 F932 Front Mow Tractor Adjustable Seat Mount USD 29.99. John Deere 316 w/Onan 322 330 332 420 430 318 Tractor Brake Rod Springs USD 14.99. John Deere 316 w/Onan 330 318 Tractor Hydraulic Line - Power Steering Outlet USD 9.99. These parts may be dusty, dirty, have surface rust, be scuffed or scratched. (Cub Cadet, Troy Bilt, Kohler, Briggs, Tecumseh, Polaris, Arctic Cat, Suzuki, Wheel Horse, Bolens, Mitsubishi Satoh, Murray, Stihl, Husqvarna, [Car parts: tons of classic Porsche 944 parts!] }. ). Used part off a 79263 42” snow blower for the 260 series tractors. Will not work with the C-300-400-500 or XI series tractors. Email any questions Please keep in mind your buying a used part,we do our best to make sure the part is in good use able condition. Some times we screw up and a bad part gets out there it happens but we fix our mistakes,look at our feedback we do our best to make sure your happy with your part. If you do get a part your not happy with its not the end of the world you simply contact us for a replacement part or refund. Sorry, Illinois residents have to pay IL sales tax. TORO / Wheel Horse Mid Hitch Latch Assembly 102639-01 for C-101 NOS. 1978 8-SPEED WHEEL HORSE C-101 GARDEN TRACTOR MODEL #81-10K801. 102639 ASSY MID HITCH LA R. C-120 8-Speed Tractor. C-81 8-Speed Tractor. C-125 8-Speed Tractor. C-105 8-Speed Tractor. B-80 4-Speed Tractor. C-85 8-Speed Tractor. 8 hp 4-Speed Tractor. &amp;amp;lt;style type="text/css"&amp;amp;gt;. 1723092 PLATE LOWER HITCH. 1723106 HITCH ASSEMBLY. Mouse here to zoom in. 1723044 PLATE SIDE. FOR SALE IS A USED FRONT HITCH / ASSEMBLY LATCH / ROD-LATCH PIVOT / ROD-LOCK FOR A WHEEL HORSE 310-8 LAWN TRACTOR. OAL of pin is 5 3/4". OAL of pin is 6-1/2".